No One Killed Jessica is a 2011 Indian biographical thriller film starring Rani Mukerji and Vidya Balan, produced by UTV Spotboy and directed by Rajkumar Gupta. This film is based on the Jessica Lal murder case. The score was composed by Amit Trivedi, who worked on the soundtrack for Dev D (2009). The character of Jessica's older sister, Sabrina Lal, is played by Vidya Balan, and the character of the news reporter following the story is played by Rani Mukerji. Upon release, the film garnered positive critical reviews and enjoyed a successful outing at the box office. No One Killed Jessica received four nominations at the 57th Filmfare Awards, including the Filmfare Award for Best Film and the Filmfare Award for Best Actress; it won the Filmfare Award for Best Supporting Actress for Rani Mukerji's performance. Tending bar at an elite event in Delhi, India, Jessica (Myra Karn) refuses to serve three men after last call. One of the men, Manish (Mohammed Zeeshan Ayub), who's the son of a big-time politician, shoots her in the head in response. There are dozens of eyewitnesses, but as Jessica's sister, Sabrina (Vidya Balan), discovers, they are either conveniently forgetful or willing to sell their testimony to the highest bidder, leaving an open-and-shut case hostage to greed and political influence. The film, set in New Delhi, was inspired by the true story of the controversial Jessica Lal murder case. The director explained that the title was inspired by a 2006 headline of a news story that ran when the accused killer in an infamous murder case was acquitted by a trial court. The events and the subsequent media coverage sparked nationwide protests, resulting in an appeal and re-opening of the murder case and the subsequent sentencing of the killer. No One Killed Jessica is based on the true story of Jessica Lal, a Delhi-based model and restaurant worker who was shot in 1999 at a New Delhi restaurant by Siddharth Vashisht, better known as Manu Sharma. The killer was the son of the wealthy, influential, and intimidating Haryana politician, Venod Sharma, a close aide of the chief minister of Haryana, Bhupinder Singh Hooda. Jessica, along with actor and model Shayan Munshi, were closing the bar at the restaurant where they worked. They were approached by Manu and his two friends. Infuriated by Jessica's refusal to serve them drinks after the bar closed, Manu fatally shot Jessica. The subsequent investigation and trial were stymied by Manu's family, who did not hesitate to use their political, financial, and law enforcement connections to intimidate, coerce, and bribe the majority of the witnesses to the crime. The case then became an uneven battle between Jessica's family (especially her sister Sabrina) and Manu's high-powered family and their associates in the local government. In February 2006, the court acquitted Manu and his friends, citing a lack of sufficient evidence. This set off a public outcry and widespread protests, which as depicted in the movie, were led by Prabhloch Singh, the founder of an organization called the "Middle Finger Protests" from Manu Sharma's hometown Chandigarh. The backlash forced the re-opening of the investigation, which was placed on a judicial fast track. In December 2006, Manu was found guilty and sentenced to life imprisonment. The film was released on 7 January 2011. It received positive reviews from critics and was also well received by the viewing public. No One Killed Jessica recovered its cost even before release through associated satellite and music rights. No One Killed Jessica received mostly positive reviews from critics. Nikhat Kazmi of the Times of India gave it four out of five stars, saying that the film "unleashes a myriad emotions". Taran Adarsh of Bollywood Hungama also gave four out of five stars, describing it as "a remarkable blend of facts and fiction inspired by a series of real-life episodes, which has thankfully not been presented as a tedious biography or in a mind-numbing docu-drama format." Anupama Chopra of NDTV gave the film three out of five stars, claiming that the film was "several notches ahead of the tripe we’ve been subjected to in theatres lately." Rajeev Masand of CNN-IBN gave it two and a half out of five stars, calling it a "full-on melodrama that doesn't always ring true." Mayank Shekhar of the Hindustan Times gave it three out of five stars. Bollywood actor Amitabh Bachchan described No One Killed Jessica as a "pertinent, media friendly and brave effort by the makers. The performances living up to the title and story of the film." Rotten Tomatoes gives it a 71% rating based on 7 critic reviews. The film's score was composed by Amit Trivedi, who also worked with Gupta on Aamir. The lyrics were written by Amitabh Bhattacharya. The album received generally positive reviews from critics. During the filming of scenes in Delhi, the building for the University School of Information Technology, one of the 12 on-campus schools of Guru Gobind Singh Indraprastha University, had its facade dressed up to look like the Patiala House District Court. In the middle of filming, the university's vice chancellor, Dilip Bandopadhyay, was prevented from entering his own campus. Bandopadhyay argued with bouncers, on guard outside the main gate, to let him enter while the cameras rolled, allegedly without his permission. As a result, the university terminated the contract of a faculty member accused of organising the film shoot on campus. ^ No One Killed Jessica: UK Cinema Release Date. ^ a b No one killed Jessica recovers cost before release. Business Standard. Retrieved 8 January 2011. ^ Adesara, Hetal (16 December 2011). "No one Killed Jessica takes a slow start". Business of Cinema. Retrieved 17 December 2011. ^ "Vidya Balan and Rani Mukherjee in No One Killed Jessica". Bollywood Hungama News Network. 23 January 2010. Retrieved 25 January 2010. ^ "'No One Killed Jessica' now also stars Rani Mukherjee". India Times Movies. 22 January 2010. Archived from the original on 25 January 2010. Retrieved 25 January 2010. ^ Sharma, Garima (20 January 2010). "Who's playing Jessica?". The Times of India. ^ No One Killed Jessica rocks at the box office. Oneindia.in. ^ "No One Killed Jessica". The Times of India. 22 February 2006. Retrieved 22 December 2011. ^ "Aami". indiainfo. (India Fm). 8 April 2009. ^ "'No One Killed Jessica' not based on murder case'". The Hindu. 11 November 2009. ^ Sahni, Diksha (7 January 2011). "Review Round-Up: 'No One Killed Jessica' Impresses" (Blog). The Wall Street Journal. Retrieved 20 February 2011. ^ Kazmi, Nikhat (6 January 2011). "No One Killed Jessica: Critic's Review". Times of India. Retrieved 10 January 2011. ^ Adarsh, Taran (5 January 2011). "No One Killed Jessica: Movie Review". Bollywood Hungama. Retrieved 10 January 2011. ^ Chopra, Anupama (7 January 2011). "Movie Review: No One Killed Jessica". NDTV. Archived from the original on 9 January 2014. Retrieved 10 January 2011. ^ Masand, Rajeev (8 January 2011). "Masand: 'No One Killed Jessica' is melodramatic". CNN-IBN. Retrieved 10 January 2011. ^ Shekhar, Mayank (7 January 2011). "Mayank Shekhar's Review: No One Killed Jessica". Hindustan Times. Archived from the original on 10 January 2011. Retrieved 10 January 2011. ^ "Amitabh Bachchan's Weblog". Bigb.bigadda.com. 6 January 2011. Retrieved 8 January 2011. 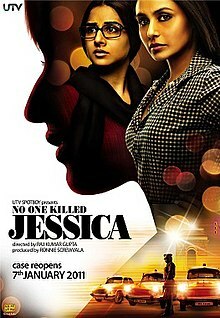 ^ "No One Killed Jessica (2011)". Rotten Tomatoes. Retrieved 13 February 2018. ^ IANS (4 May 2011). "Phalke award for Rani, Priyanka". Times of India. Retrieved 6 May 2011. ^ India Today group (3 December 2011). "Rani Mukherjee, Zoya Akhtar awarded,". India Today. Retrieved 3 December 2011. ^ "No One Killed Jessica – Music Review". 2010. Retrieved 2 December 2010. ^ "Jessica film shoot at IP, VC stranded". The Economic Times. 21 April 2010. Retrieved 8 January 2011. ^ Deepu Sebastian Edmond (9 July 2010). "Film shooting: Sacked by IP varsity, teacher says he had all permissions". The Indian Express. Retrieved 8 January 2011.